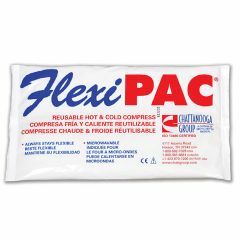 FlexiPac Hot And Cold Compress Hot and Cold Therapy Made Easy. Maximum convenience for home, work or anywhere. AllegroMedical.com has the perfect, economical solution for your hot and cold therapy needs...Chattanooga FlexiPac Hot and Cold Compress. These durable yet affordable packs can be used anywhere you need ice or heat therapy. Flexi-Pacs are designed to conform to your body whether you are applying ice or heat therapy to your elbow, ankle, neck or lower back. Keep some in the freezer for sprains, strains, burns or other sports injuries. Fantastic product - Great price! relieves muscle strain. relieves migraine pain. When cold, the FlexiPac helps to relieve muscle strain and migraine pain. Heated, it helps relieve tight muscles in my neck after a busy day of gardening. I've used these for many years, and my home store provider quit handling this item. I was delighted to find them online at such a wonderful price. Thank you so much.